IDYLLEN. - Liebesbriefe. "Le Billet Doux" und "La Confidence". Der geflügelte Amorknabe mit Rose, Pfeil und zwei Täubchen liest zusammen mit einer jungen Schönheit einen Liebesbrief in (lesbarer) Gedichtform. Junge Frau läßt ihre beste Freundin einen Liebesbrief lesen. Gegenstücke, jeweils im Oval, unten die Inschrift. - 2 Kupferstiche von S.Ch. Miger nach F. Boucher, um 1770, je 32 x 24,5 cm. Abzüge des frühen 19. Jahrhunderts auf Velin. - Im Papier durchgehend leicht gebräunt. Gerahmt in Waschgoldleisten. Insgesamt zwei Darstellungen auf zwei Blättern. POTSDAM. "Prospect des Königl. Preußischen Pallastes bey Potsdam, wie sich selbiger nach Sansoucy u. Bornstaedt hin praesentiert". 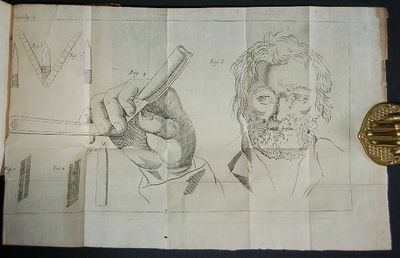 - Kupferstich (Guckkastenblatt) bei F. Riedel, Augsburg, um 1770, 28,5 x 39 cm. In der Kaiserlichen Akademie in Augsburg erschienenes, seltenes, nicht koloriertes Guckkastenblatt von guter Erhaltung. Historiarum Cathedralis Ecclesiae Zagrabiensis Partis Primae Tomus I. Praemissis praeliminaribus, continens seriem episcoporum ab anno M.X.C.L. ad annum MDCIII. et tam Episcoporum quam et alias notitias (= alles Erschienene!). [N.p., but likely northwest Pennsylvania, 1770. Old folds. Three very small separations at folds with no real loss, some wrinkling, else near fine. An intriguing, detailed, and very rare manuscript map of northwestern Pennsylvania, created by noted surveyor and soldier Robert Lettis Hooper, Jr. The map encompasses the present-day Pennsylvania counties of Erie, Crawford, Venango, Armstrong, Jefferson, and Clarion, a district that would later become famous due to its oil and gas deposits. In fact, "Oil Spring" and "Oil C[reek]" are shown in the northeast corner of the map. The scale of the map is fifteen miles to an inch, and covers the area from Presque Isle on Lake Erie (site of the present-day city of Erie) in the northwest to the region just to the north and east of Pittsburgh (which is not shown) in the southwest. The western branch of the Susquehanna is drawn in the southeast, and the area that is now encompassed by the Allegheny National Forest is in the northeast. The dominant feature of the map is the "Allegany River," shown snaking its way north and east to its headwaters. More than a dozen tributaries, rivers, and creeks branching off the Allegheny are shown and identified, as is the Buffalo Swamp and Fort "Wenango" (i.e. Venango). Two roads are indicated on the map in dotted lines, one showing the "road from Fort Pitt to Wenango" and the other, in the far northeast, marking the "Indian Path to Cayuga." Hooper notes that the fort at Presque Isle has been demolished, and identifies the ruins of another French fort. Along the run of the Allegheny where it branches northeast at Fort Wenango, Hooper notes: "the current of this river is moderate and the canoeing is good to the mouth of Oil C." In the area just northwest of present-day Erie, he writes: "when you have passed those short broken hills that confines the Allegany [sic] River, the country is level, the soil thin and a whitish clay, through which the water does not readily penetrate." 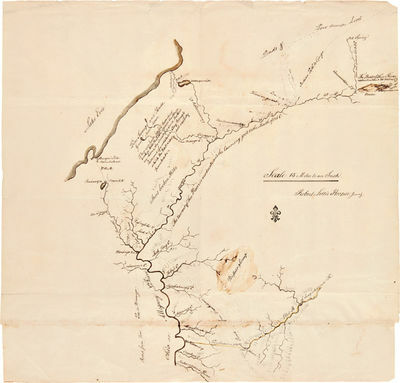 In the south-central portion of the map he has drawn a line connecting the Allegheny and Susquehanna rivers and has added a note reading, "purchased in 1768," likely referring to an early land speculation in which he engaged. He has signed his name on the map in the right margin. Robert Lettis Hooper, Jr. (ca. 1730-97) was born in New Jersey, the son of Robert Lettis Hooper, Chief Justice of the colony of New Jersey. Early in his life Hooper was involved in the milling business and as a merchant in Philadelphia. In the 1760s he made trips west to Fort Pitt, and was contracted for making land surveys and engaged in other projects throughout the region for the colonial government for several years. During the Revolution he served as Deputy Quartermaster General in the Continental Army, and was responsible for the area covering Northampton, Bucks, Berks, and Philadelphia counties in Pennsylvania, as well as Sussex County in New Jersey. After the war he became involved in the iron business in New Jersey, operating the Durham Ironworks and the Ringwood Ironworks, and continued working as a surveyor, laying out the towns of Mine Hill and Bloomsbury in New Jersey. He served in the New Jersey legislature in the 1780s, and was involved in land sales in Pennsylvania in the 1780s as well. A great colonial manuscript map of northwestern Pennsylvania. Tringa Vanellus, Gavia Vulgaris (Varius Alba). Recherches sur le vrai moyen de perfectionner les pendules à seconde, destinées à indiquer les équations journalières du soleil par le moyen d?une cadrature simple, solide, et cela avec une précision à laquelle on n?est pas encore parvenue. 2 parties en 1 volumes. America Septentrionalis Concinnata juxta Observationes Drin Academiae Regalis Scientiarum et nonnollorum aliorum, et juxa annotations recentissimas. Augsburg Tobias Conrad Lotter um 1770 - Altkolorierte Kupferstichkarte von G. F. Lotter nach G. de L&#146;Isle. Bildausschnitt 45,5 x 58 cm, Blattgr. 53,5 x 65,5 cm. Ritter, Die Welt aus Augsburg. Landkarten von Tobias Conrad Lotter und seinen Nachfolgern, p. 48. Attraktive Karte von Nordamerika nach der um 1700 erstmals publizierten Vorlage von G. de L&#146;Isle; die Platte von J.F. Probst an T.C. Lotter; schönes Kolorit, breite Ränder und guter Druck, dünnes Papier. La Nouvelle philosophie dévoilée, Et pleinement convaincue de Lèse-Majesté Divine & Humaine au premier chef. 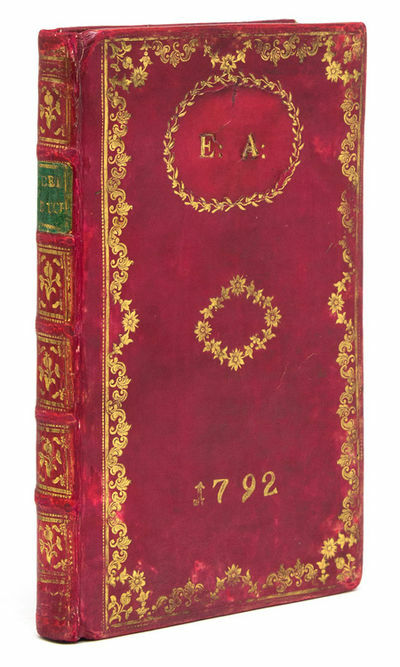 Amsterdam:: Erven van F. Houttuyn,, 1770-1775.. First printing. Three quarter Calf. Very Good. Very Good. Two volumes complete. Six parts bound in two, with 190 superb original hand-colored copperplate engravings. Quarto (8.75 x 11.25 inches, 22.2 x 28.6 cm). Three quarter calf . Speckled ochre paper over boards. Gilt-tooled spine with five raised bands. Gilt lettering on red and green toned calf set in second and third panels. Uniform to both volumes. Paper loss to boards however the spine is handsome and binding sound. The 190 hand-colored copperplate engravings of shells are richly painted with absolutely no offset or foxing to the plates. A beautiful collection all around. Translated: GW Knorr' s delight of the eyes and the spirit, or Collection of allerley known Horns and scallops, which are depicted in its own colors VOLUME I: Pp. , 118, plus 90 hand-colored copperplate engravings. (Organized thus: First Part; c. 1770, title-page, [intro], pp. 1-44, plates #1-30. Second Part; c. 1772, title-page, pp. 45-82, plates # 1-30, pl. 27 precedes pl. 26. Third Part; c. 1772, title-page, pp. 83-118, plates #1-30, plates 21 & 22 and 26 & 27, pl. 22 precedes pl. 21, and pl. 27 precedes pl. 26.) VOLUME II: Pp. 117, plus 100 hand-colored copperplate engravings. (Organized thus: Fourth Part; c. 1773, title-page, pp. 1-34, plates #1-30. Pl. 2 precedes pl. 1 and pl. 7 precedes pl. 6. Fifth Part; c. 1774, title-page, pp. 35-62, plates #1-30. Pl. #6 & 7, 16 & 17 and 26 & 27, bound in opposition . Sixth Part; title-page, pp. 63-117, plates #1-40. Also includes; The Systematic Arrangement of Horns and Shells, and Alphabetical Register. This Dutch edition was not issued with the hand-colored frontispiece, as were the French and German editions, therefore it is complete. Each volume has four armorial bookplates from members of the family Oates: Jo, Edward, William Edward and Robert Washington Oates on the first four leaves. Robert Washington Oates (1874-1958) funded the Oates Museum, which commemorates the life and work of The Reverend Gilbert White (1720-1793), author of the renowned work The Natural History and Antiquities of Selborne). Georg Wolfgang Knorr (1705-61), a dedicated painter and engraver of natural subjects, earned the attention and respect of the celebrated Nuremberg doctor and Patron of the Arts, Christoph Jakob Trew, association with whom was a merit of excellence and achievement. The complete title of this fabulous conchology is "G. W. Knorr's Enjoyment for the Eyes and for the Mind or Collection of many well known horns and shells in their original colors: now examined, improved, continued, and published with a whole new Low-German [Dutch] description." During the 18th and early 19th centuries, shell collecting was a near obsession with European Aristocracy as well as Naturalists. The Dutch, in particular, were passionate collectors of the newly discovered natural curiosities acquired from around the globe. This work documents and illustrates the vast array of the private holdings, with the name of each collector engraved beneath his or her own shell. In addition, the Dutch produced some of most lavish color plate volumes of the era. And although this work first appeared in both French and German editions, this Dutch edition features the richest coloration, which mirrors the actual specimens from which they were produced. (Dance p. 217; Blunt and Stearn p. 168; Buchanan, Nature into Art p. 189-191). TAGESZEITEN. Le matin. Le soir. La nuit. Drei Darstellungen auf drei Blättern. - Kupferstiche von Em. de Ghent nach P. Baudouin, um 1770, je 30,5 x 23 cm. Thieme-Becker Bd. XIII, S. 519: "Die gesuchtesten Stiche G.s sind 4 Einzelblätter, Tageszeiten nach Gouachemalereien von Baudouin (E. Bocher, Baudouin, 1875, Nrs. 32, 33, 46, 35)." Vorhanden sind drei (von vier) Darstellungen: Bocher 32, II (von III, Frühdruck vor der Schrift); Bocher 46, II (von III, vor der Schrift und der Bedeckung); Bocher 35, II (vor der Schrift). - Le matin: Ein Kavalier betritt mit einem Edelknaben das Schlafzimmer einer jungen Dame, die halbentblößt im Bett schläft. Le soir: Ein Kavalier lugt zur Türe eines Boudoirs herein, in dem sich eine nackte junge Dame von zwei Zofen ankleiden läßt. La nuit: In einem mondbeschienenen Park legt sich ein Kavalier zu seiner Geliebten, eine Amorstatue gebietet Schweigen. BONN. "Prospect der neuen Residenz zu Bonn des Churfürsten von Kölln von der Franciskaner Seite anzusehen". - Kupferstich (Guckkastenblatt) von Leizelt, Augsburg, um 1770, 26 x 38 cm. In der Kaiserlichen Akademie in Augsburg erschienenes, seltenes Guckkastenblatt. - Gut erhalten mit schmalem Rändchen, unten mit geringen Textverlust. Feines Altkolorit. Gerahmt. Vue Perspektive de la Ville de Berlin Capital du Royaume de Prusse. Daumont ca. 1770., Paris - Kolorierter Kupferstich. Zu sehen ist eine Gesamtansicht bzw. Panorama Berlins im Format eines Guckkastenblattes. In einem schönen goldenen Rahmen mit Passepartout, Größe des Rahmens ca. 51 x 40,5 cm. Oben an der Bildkante eine spiegelverkehrte Schrift lesbar: "Berlin Ville Capitalle de Prusse". Siehe Foto. Weitere Informationen auf Anfrage. Illustrations of natural history. Wherein are exhibited upwards of two hundred and forty figures of exotic insects, according to their different genera; very few of which have hitherto been figured by any author, being engraved and coloured from nature, with the greatest accuracy, and under the author's own inspection . With a particular description of each insect: interspersed with remarks and reflections on the nature and properties of many of them. To which is added, a translation into French. Beschryving van Guiana, of de Wilde Kust, in Zuid-America, Betreffende de Aardrykskunde en Historie des Lands, de Zeeden en Gewoontes der Inwooners, de Dieren, Vogels, Visschen, Boomen en Gewassen, als mede de eerste Ontdekking dier Kust, de Bezitten der Spanjaarden, Franschen en Portugeezen en voornaamelyk de Volkplantingen der Nederlanderen, als Essquebo, Demerary, Berbice, Suriname, en derzelver Rivieren, met de noodige Kaarten en Afbeeldingen der Forten. Waarby komt eene Verhandeling over den Aart en de Gewoontes der Neger-Slaaven. Eerste Deel. - Kupferstich ( v. 2 Platten ) n. F.I.S. ( Saur ) b. Georg Balthasar Probst in Augsburg, um 1770, 33,5 x 104 Nicht bei Fauser: Angelika Marsch, Friedrich Bernhard Werner, S. 143 ( 6. Zustand mit Privileg und Plattennummer 61) weist 3 Exemplare nach.- Monumentale Ansicht von Osten über den Rhein, mittig der Dom, links die Orangerie, rechts das Schloß. Im Himmel (mittig ) ein flatterndes Band mit dem Titel, links im Himmel das "Mainzer Rad". Unter der Ansicht Erklärungen von 1 - 40 in lat. und franz. Sprache, oben rechts in deutscher Sprache. TA., Dom, "Vue perspective de la Cathédrale de Milan". - altkol. 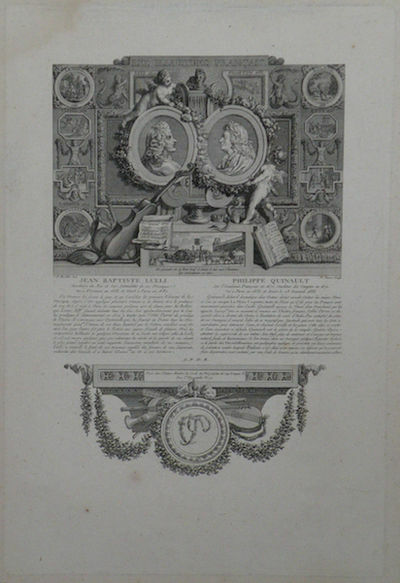 Kupferstich ( Guckkasten ) b. Mondhare in Paris, um 1770, 25 x 42 Der Titel unter der Darstellung in 4 Sprachen. Histoire naturelle des glacières de Suisse, traduction libre de l'allemand [. ], par M. de Kéralio. Paris. [1770-1780]. Small emblematic portraits of Lully and Quinault are set in a richly illustrated border incorporating numerous musical and literary motifs, including scenes from Lully's operas and musical instruments, with biographical notes on both the composer and librettist below. 334 x 226 plus wide margins. With "Les Illustres Français" to head. Slightly browned; dampstaining to blank upper margin. A fine impression on laid paper. . Koma 317. Kst.- Karte, b. Tob. Con. Lotter, "Borussiae Regnum complectens .". - mit altem Flächenkolorit, um 1770, 49,2 x 57 Jäger, Nr. 159. - Dek. Karte mit prachtvoller Kartusche im Rokokostil ( mit Portrait Friedrich des Großen ). 2. Zustand der Prussiakarte von Lotter ( ohne Datierung ), die dieser - nach der Teilung des seutterischen Verlages ( 1757 ) - neu anfertigte. Kst.- Karte, b. T. C. Lotter, "Carte nouvelle des Royaumes de Galizie et Lodomerie avec le District de Bukowine". - mit altem Flächenkolorit, um 1770, 48,5 x 59,5 Seltene Karte von Galizien. Unten links der Titel zusammen mit den Erklärungen in einer Art Textkasten. Mit Einzeichnung der Poststraßen und -stationen. FRANKFURT. "Ansicht der Stadt Francfurt a/m. von der Nordseite". Gesamtansicht über eine Allee hinweg. - Altkol. Kupferstich von J.S. Walwert nach Christian Stöcklin, um 1770, 28,5 x 43 cm. Thieme-Becker Bd. XXXII, S. 85/6 (Stöcklin). - Der Architektur- und Landschaftsmaler Christian Stöcklin (auf unserem Blatt "Stöcklein") wurde 1741 in Genf geboren. Er studierte in Bolgne bei Bibiena und in Rom, arbeitete in Stuttgart und Ludwigsburg. 1768 wurde er Frankfurter Bürger. Er starb 1795. Die Folge von vier Frankfurter Ansichten, gestochen von Walwert, ist bei Thieme-Becker erwähnt. - Mit schmalem Rändchen um die Einfassungslinie. Feines altes Kolorit. Vue du Manege Couvert de Berlin avec la Statue de Frederic Roy de Prusse.'. Bürgerliche Geschichte des Königreichs Neapel, nach der letzten ansehnlich vermehrten und verbesserten italiänischen Ausgabe ins deutsche übersetzet und mit neuen Anmerkungen vermehret von Otto Christian von Lohenschiold [und J. F. le Bret]. Ulm, Frankfurt & Leipzig, Gaum (ab Bd. 3: Hartknoch), 1758-1770. - Large 4to. 4 vols. With the frequently lacking engr. portrait frontispiece, engr. plate, and an engraving in the text. Contemp. calf with giltstamped label to spine. All edges red. marbled endpapers. Only German edition of this important study of the history of Naples up to the year 1735. The Naples jurist and historian Giannone was persecuted by the inquisition for his critical views on the Roman Curia; the book was banned (cf. Reusch II, 777f.). - The plate opposite p. 195 in vol. 1 shows coins; the text engraving on p. 129 of vol. III depicts a seal. - Bindings slightly rubbed; interior somewhat browned and with occasional waterstains. Graesse III, 79. Enslin 120. Meusel VIII, 340. Cf. Branca 1143. Reusch II, 784ff. - Aquarell und Deckfarben auf braunem Velin. 27,2:37,8 cm. Vergleichsliteratur: M. Bircher u. G. Lammel, Helvetien in Deutschland. Schweizer Kunst aus Residenzen deutscher Klassik 1770-1830. Zürich, 1991, S. 98, Farbabb. S. 99, Nrn. 74-80 mit Abb. Heß erlernte das väterliche Gewerbe eines Metzgers. Wenn er zum Vieheinkauf über Land ging, zeichnete er oder nahm sich Tierköpfe von der Schlachtbank als Modell mit heim. Auf diese Weise und Gemälde kopierend, bildete er sich vorzugsweise autodidaktisch. Einige Monate (1778) genoß er die Anleitung von H. Wuest und gewann die Freundschaft von H. Freudweiler, J. H. Meyer und S. Gessner, dessen Landschaften ihn entscheidend beeinflußten, von Lavater und Bodmer, durch die er Käufer, namentlich seiner Hochgebirgsbilder auch unter Engländern und Dänen, Deutschen und Franzosen fand. Er unternahm zahlreiche Wanderungen in die Alpen, ins Tessin und an den Comersee; einmal ging er bis Mailand und Genua. 1792 besuchte er Chamonix und malte ein berühmtes Montblanc-Bild, das in England verschollen ist. Auf diesen Reisen entwickelte er seinen Sinn für die Größe der Alpenwelt und eine bis dahin unerreichte Naturnähe der malerischen Darstellung. Schließlich wanderte er nach Rom (1794), wo ihn die Kunst Claude Lorrains und N. Poussins anzog. Als 1798 die französische Revolution das Reisen erschwerte, verlegte er sich aufs Radieren und schuf etwa achtzig Platten nach seinen früheren Gemälden und Zeichnungen. Das Muotatal ist im Kanton Schwyz östlich vom Vierwaldstätter See gelegen. Denkmal des Johannes Gutenberg (um 1400 &#150; Mainz &#150; 1468) von B. Thorvaldsen (1770-1844). - Feder in Grau, grau laviert, mit Deckweiß gehöht, mit Bleistiftlinie umrandet, auf bräunlichem Velin, rechts unten datiert &#132;10. März 37." Ca. 17:12,6 cm. Auf Untersatz montiert, dort von alter Hand bezeichnet. In den Rändern ungleich beschnitten, etwas fleckig. Die Malerin und Zeichnerin Marianne Chodowiecka war eine Nichte von D.N. Chodowiecki (1726-1801), dessen Töchter Susanne Chodowiecka (1763-1819), Jeanette (1761-1835) und Henriette (1770-1880) ebenfalls künstlerisch tätig waren. Jeanette, die seit 1783 mit Jacques Papin verheiratet war und mit diesem seit 1793/94 in Potsdam lebte, war ihre Mutter. Marianne schuf Porträts, Genre und Interieurs und war 1815-1829 in Potsdam und Leipzig tätig. Bekannt ist von ihrer Hand beispielsweise ein Porträt des bekannten, in Berlin tätigen Musikers, Komponisten und Dirigenten Carl Friedrich Zelter (1758-1832). Zudem fertigte sie Kopien nach ihrem Großvater, dessen Stücke aus dem Nachlaß sie der Berliner Akademie vermachte. Das Gutenberg-Denkmal wurde 1837 in Mainz aufgestellt. Yverdon, 1770. Second edition, 12mo, xiv, , 154, pp., 2 folding engraved plates demonstrating the sharpening of the razor and the shaving of the beard, early engraved bookplate of Labat, cont. half calf, head and foot of spine lightly chipped, corners rubbed. The first practical guide to shaving for men, which includes information regarding razors and surgical instruments. Perret describes both the razors (including a safety razor of his own design, the rasoir á rabot) and other blades and edged tools for use in surgery and various trades. The final chapter of the work deals specifically with bloodletting. Paris. [1770-1780]. Small emblematic portraits of Lully and Quinault are set in a richly illustrated border incorporating numerous musical and literary motifs, including scenes from Lully's operas and musical instruments, with biographical notes on both the composer and librettist below. 334 x 226 plus wide margins. With "Les Illustres FranÃ§ais" to head. Slightly browned; dampstaining to blank upper margin. A fine impression on laid paper. . Koma 317. S.l. : S.n., 1770. Fine. S.n., S.l. 1770, In 4 (17,5x24cm), 388pp. (42), relié. - Beautiful original manuscript written in black pen set, elegant very legible handwriting, all strictly ordered in a nice layout, airy. Full Calf glossy speckled time. Back tooled raised. Roulette tail. Part of title in red morocco. Caps threadbare. Upper joint split into head and tail. Good copy. Physical description of all countries of the world, outlines their history. --- Please note that the translation in english is done automatically, we apologize if the formulas are inaccurate. Contact us for any information! 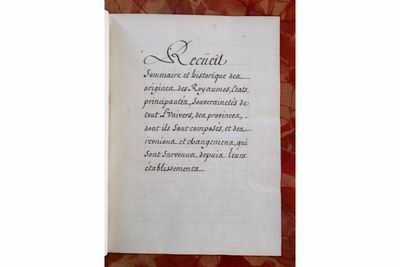 - [FRENCH VERSION FOLLOWS] Très beau manuscrit original rédigé à la plume noire, réglé, d'une élégante écriture très lisible, l'ensemble rigoureusement ordonné, dans une belle mise en page, aérée. Reliure en plein veau glacé d'époque moucheté. Dos à nerfs orné. Roulette en queue. Pièce de titre en maroquin rouge. Coiffes élimées. Mors supérieur fendu en tête et queue. Bon exemplaire. Description physique de tous les pays du monde, grands traits de leur histoire. à Paris: Chez Saillant & Nyon|& Delallain, 1770. Fine. Chez Saillant & Nyon & Delallain, à Paris 1770, 2 tomes en 2 Vol. in 8 (12x19,5cm), iv, 385pp. et (2) 314pp. (2), relié. - Second edition, partly original, after the first published in Berlin last year. 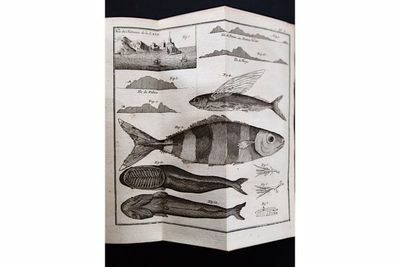 The figure includes 16 folding plates in fine of the second volume, 3 maps, wildlife and people ... (2 planks are missing). This edition contains added: "Historical Journal of the trip is to the Falkland Islands" and valuable "Notes" by Delisle de Sales at the bottom of pages. Demi sheepskin blond marbled time. Smooth spine decorated. Part of title in red morocco. Piece volume number in black morocco very rubbed. Lack tail and along the upper jaw of Volume II. Title page of the first volume, high margin weakened. Good copy. Father Pernetty was chaplain of the journey undertaken by Bougainville to lead settlers from Saint Malo to the Falkland Islands and especially to take possession of ïles in the name of France; Back in France, he wrote daily account of his journey that gives pride to natural history. The "Observations on the Strait of Magellan and the Patagonian" were made from other trips, including that of Bougainville. Is contained in the introductory remarks, a curious story of the giants of Patagonia. --- Please note that the translation in english is done automatically, we apologize if the formulas are inaccurate. Contact us for any information! - [FRENCH VERSION FOLLOWS] Seconde édition, en partie originale, après la première parue à Berlin l'année précédente. L'illustration comprend 16 planches dépliantes in fine du second volume, 3 cartes, plans, faune et habitants... (2 planches sont manquantes). Cette édition contient en sus : "Journal historique du voyage fait aux îles Malouines" et les précieuses "Remarques" par Delisle de Sales en bas de pages. Reliure en demi basane blonde marbrée d'époque. Dos lisse orné. Pièce de titre en maroquin rouge. Pièce de tomaison en maroquin noir très frottée. Un manque en queue et le long du mors supérieur du tome II. Page de titre du tome I fragilisée en marge haute. Bon exemplaire. L'abbé Pernetty fut l'aumonier du voyage entrepris par Bougainville pour mener des colons de Saint-Malo aux îles malouines et surtout pour prendre possession des ïles au nom de la France ; de retour en France, il rédigea la relation quotidienne de son voyage qui fait la part belle à l'histoire naturelle. Les "Observations sur le détroit de Magellan, et sur les Patagons" ont été faites d'après d'autres voyages, notamment celui de Bougainville. On trouvera dans les remarques préliminaires, une curieuse histoire des géants de la Patagonie. 1770-89. first edition. The First Comprehensive Account of the Avifauna of Holland"With One Hundred Fine Hand Colored Engraved PlatesNOZEMAN Cornelius. Nederlandsche Vogelen; Volgens Hunne Huishouding, Aert, en Eigenschappen Beschreeven door Cornelis Nozeman, Leeraer der Remonstranten, en Mede-Directeur van't Bataefsch Genootschap der Proefondervindelyke Wysbegeerte te Rotterdam. Alle naer 't leeven geheel nieuw en naeuwkeurig getekind, in 't koper gebragt, en natuurlyk gekoleurd door, en onder opzicht van Christiaan Sepp en Zoon. Amsterdam: Jan Christiaan Sepp, 1770-1789. First edition. Volumes 1 & 2 only (of 5).Folio ( 20 7/8 x 14 1/4 inches; 531 x 362mm.). [1, title, verso blank], ii, dedication], [ii, list of plates], -92 pp; [1, title, verso blank], ii, dedication], [ii, list of plates], -194, [ix, index] pp; Two additional hand-colored engraved title-pages and one hundred fine hand-colored engraved plates. Early to mid nineteenth century quarter green morocco over blue marbled boards. Spines with six raised bands ruled and lettered in gilt. A fine tall copy of "the first comprehensive account of the avifauna of Holland" (Anker). This book was published over a period of almost sixty years. Nozeman was a Dutch clergyman with a keen interest in Natural History. 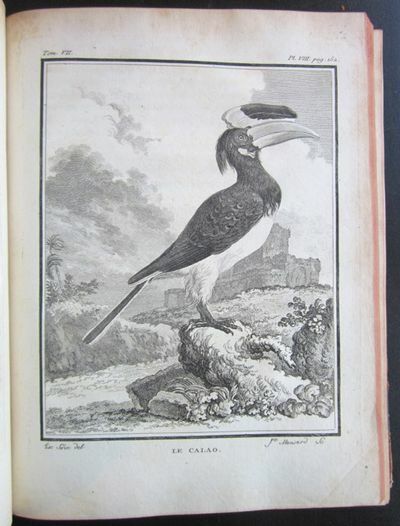 He possessed a cabinet of natural-history specimens, and was the first editor of this monumental work on Dutch birds. Tragically he died before the publication of volume two in 1789. He was succeeded by Dr. Martinus Houttuyn, who also died before the publication of volume three in 1797. The project was completed with the timely help of C. J. Temminck who owned many of the specimens featured, and who supplied many of the descriptions, and by the father and son engravers and booksellers Christiaan and Jan Christiaan Sepp, the artists and publishers of the work. Landwehr notes that it was the most expensive book for sale in Holland at the time and the execution, and includes extensive notes on habitat, with great care taken to show the birds in their natural setting, often depicting even their nests and eggs. The price of the complete set of five volumes was fl.525.00 which makes it the most expensive book for sale in Holland at that period.Cornelius Nozeman (1720-1786) was a Dutch Remonstrant Churchman and Naturalist.Born in Amsterdam, the son of the composer Jacobus Nozeman, he was trained as a preacher and called to Alkmaar where he served 1744-1749. There he began to conduct science experiments in his free time. In 1749 he was called to serve in Haarlem, where he became a supporter of the founding of the society Hollandsche Maatschappij der Wetenschappen. In 1755 he purchased a small publishing business in Haarlem, which he kept on for a few years after leaving Haarlem. 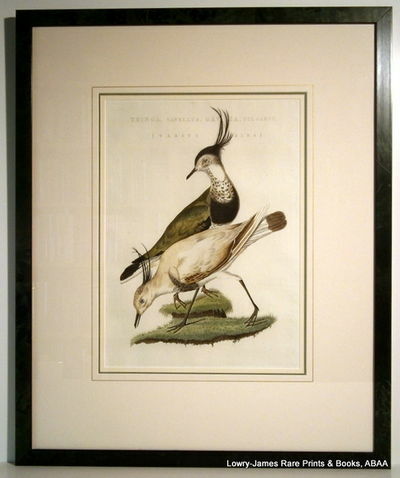 It was in Rotterdam that he began preparations for his great work on Nederlandsche Vogelen (Birds of the Netherlands) that was published in installments by Christiaan Sepp starting in 1770. 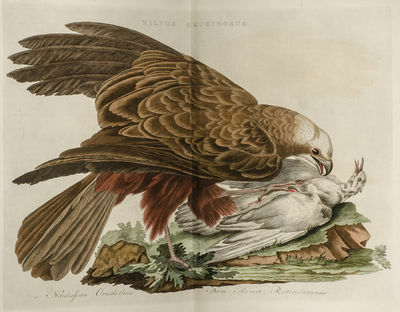 This work, finished well after both men had died in 1829, was the first "encyclopedic" book of the birds of the Netherlands (at that time including the area known today as Belgium). It was illustrated by Jan Christiaan Sepp and published by the naturalist Maarten Houttuyn. In 1767 he was awarded an honorary membership in the newly formed Maatschappij der Nederlandse Letterkunde and in 1769 he was himself one of the founders of the Rotterdam society Bataafsch Genootschap der Proefondervindelijke wijsbegeerte. In 1778, he was awarded honorary membership in the Provinciaal Utrechts Genootschap. He died in Moordrecht in 1786.Anker 369; "Fine Bird Books" 98; Landwehr "Studies in Dutch Books with Coloured Plates" p. 96, and no. 145; Nissen IVB 684; cf. Wood p. 496; Zimmer p. 469. Des Elementarbuchs für die Jugend und für ihre Lehrer und Freunde in gesitteten Ständen Erstes (- Drittes) Stück (alles). 3 Teile in 1 Band. XVI, 384; XVI, 380 S., 2 w. Bl. ; 152 S. Pappbd d. Z. (etwas fleckig und berieben) mit Rückenschild. KARL, Herzog von Braunschweig-Lüneburg (1713 - 1780). "Charles Duc Regnant de Bruswick et de Lunebourg". Kniestück nach halblinks in Uniform, rechts im Hintergrund Stadt am Fluß. 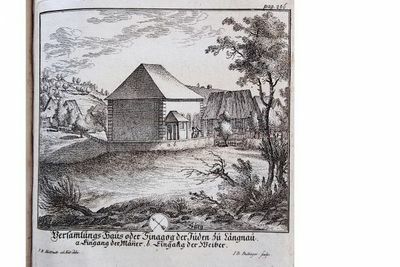 - Radierung von De Marcenay nach La Fontaine, um 1770, 31 x 22 cm (APK 3705). Les oeuvres de Virgile. Traduites en francois, le texte vis-a-vis la traduction, avec des remarques. Par M. l'Abbe Desfontaines. Nouvelle edition. (Bd. 1 - 4; komplett). Paris, Babuty, 1770. Kl.8°, LXVII, 436, 418, 434 u. 486, 1 Bl. "Approbation", Ldr. d. Zt. m weinroten Rückenschildchen u. gold. Rückenpräg. und, Rundum-Rotschnit, Kapitale etw. berieben u. m. kl. Verlusten an den Köpfen (Fuss von Bd. 4 mit kleinem Verlust an der Rückenkante), Ldr. mit einigen kleinen Abspleissungen (davon 2 am Rücken von Bd. 1), Ecken etw. bestossen, Exlibris a. Innendeckeln, Name von alter Hand a, Vakatseite in Bd. 1; innen grösstenteils sehr frisches und breitrandiges, nur sehr vereinzelt min. stockfl. Ex. Preis in CHF: 600. Bildnis eines älteren bärtigen Mannes, nahezu Halbfigur im Profil nach rechts.
. Aquarell und Deckweiß, über Bleistift, auf bräunlichem Velin, aufgezogen. 22,2:19,5 cm. Vergleichsliteratur: Ausst. Katalog: Kennst du das Land... Zürcher Künstler in Italien 1770-1870, Zürich 1977, Nrn. 68-73; Ausst. Katalog: Schweizer Zeichnungen 1800-1850 aus dem Basler Kupferstichkabinett, Basel 1991, Nrn. 137-141.. Georg Ludwig Vogel war der Sohn des Zuckerbäckers, Kaufmanns und liberalen Politikers David Vogel (1760-1849, 1803 Mitglied des Großen und des Kleinen Rates, 1813 Mitglied der Zürcher Künstlergesellschaft, 1826-1827 Präsident der Schweizerischen Künstlergesellschaft), der ihn früh im Zeichnen unterrichten ließ. Dennoch mußte er erst eine Zuckerbäcker-Lehre absolvieren und im Geschäft des Vaters arbeiten. 1808 ging er schließlich zum Kunststudium an die Wiener Akademie. Gemeinsam mit den befreundeten Mitschülern F. Pforr (1788-1812), J.F. Overbeck (1789-1869), J. Wintergerst (1763-1867), J.J. Sutter (1781-1866) und dem Zürcher Landsmann C. Hottinger (1788-1828) schloß er dort, in Opposition zum Akademiebetrieb und orientiert am Idealkonstrukt einer aus mittelalterlicher Frömmigkeit und vaterländischen Tugenden erwachsenden Malerei, 1809 den "Lukasbund". 1810 zog er mit Overbeck, Pforr und Hottinger nach Rom, wo sich die bald mit dem Spottnamen "Nazarener" belegte Gruppe, zu der 1811 auch P. von Cornelius (1783-1867) stieß, für zwei Jahre im Kloster S. Isidoro niederließ. 1811 unternahm er zusammen mit Pforr eine Reise nach Neapel. Januar bis August 1813 hielt er sich in Florenz auf, anschließend kehrte er nach Zürich zurück. Als Historien- und Genremaler lebte und arbeitete Vogel, auch nach seiner Heirat 1818 mit Elisabetha Wilhelmina Sulzer (1798-1835) aus Winterthur, im Haus seiner Eltern, dem "Oberen Schönenberg" in Zürich. 1822 unternahm er zusammen mit F. Hegi (1774-1850) eine Reise nach Paris, 1824 weilte er in Stuttgart, 1830, 1832, 1856 und 1858 in München und wiederholt in Mailand. 1831 beteiligte er sich an einer Ausstellung des Pariser Salons. Les oeuvres de Virgile. Traduites en françois, le texte vis-à-vis la traduction, avec des remarques. Par M. l?Abbé Desfontaines. Nouvelle édition. (Bd. 1 - 4; komplett). VARIAS NOTICIAS DE GEOGRAFIA YSTORIA DE LOS EMPERADORES ROMA[N]OS, CON LA DE ESPA[Ñ]A, ESFERA Y BLAS[O[N, EUROPA YMPERIOS. Zurich: Johannes Hosmeister, 1770. Fine. Johannes Hosmeister, Zurich 1770, In 4 (19x25cm), (16) 504pp., relié. - First edition, rare, illustrated with a frontispiece Holzhalt (Jews worshiping an allegory of Switzerland), a thumbnail of the same title, and two boards with a fold of the same, but engraved by Bullinger (synagogue and Jewish cemetery). Sheepskin brown half contemporary. Spine ribbed Jansenist. Part of title and volume number of black sheepskin. Accidents with gaps in mind. Bare and highly rounded corners. History of Jews in Switzerland, in which the historian and theologian Ulrich exempts Jews numerous charges and asked the Swiss to be treated with equality. After protesting, Ulrich converted to Judaism, studied and had many missionary activities. --- Please note that the translation in english is done automatically, we apologize if the formulas are inaccurate. Contact us for any information! - [FRENCH VERSION FOLLOWS] Edition originale, rare, illustrée d'un frontispice de Holzhalt (Juifs adorant une allégorie de la Suisse), une vignette de titre du même, et deux planches dont une dépliante du même, mais gravées par Bullinger (synagogue et cimetière juif). Reliure en demi basane brune d'époque. Dos à nerfs janséniste. Pièce de titre et de tomaison de basane noire. Accidents avec manques en tête. Coins dénudés et fortement émoussés. Histoire des Juifs de Suisse, dans laquelle l'historien et théologien Ulrich exempte les juifs de nombreuses accusations et demande aux Suisses de les traiter avec égalité. Après avoir été protestant, Ulrich se convertit au judaïsme, étudia et eut de nombreuses activités missionnaires. Histoire des Celtes, et particulièrement des Gaulois et des Germains, depuis les temps fabuleux, jusqu'à la prise de Rome par les Gaulois. Nouvelle édition, revue, corrigée et augmentée par M. de Chiniac.